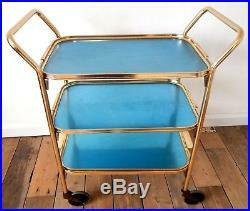 Vintage Retro 1950s Hostess Serving Tea Trolley Three Tier Mid Century Blue Gold. 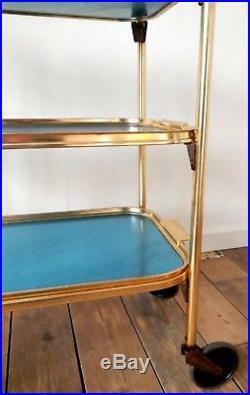 On offer a stylish vintage hostess serving tea trolley. 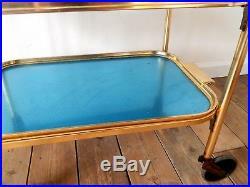 Metal gold coloured frame with blue trays. In used condition with general signs of wear as pictured including scratches and general wear to the trays. It would benefit from further cleaning. It dates to the 1950s - 1960s period - typical mid century style! 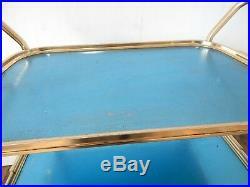 Each tray measures approx 58cm x 37cm. 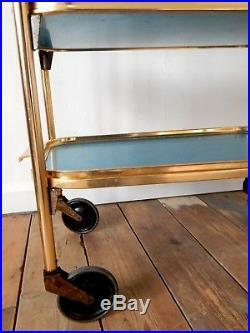 The trolley stands approx 83cm tall overall. One of the trays can be lifted off the frame - this is presently configured as the bottom tray but could be configured as the top tray instead. It dismantles easily for storage and transport and will be sent dismantled. 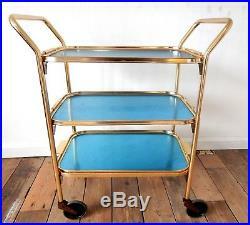 The item "Vintage Retro 1950s Hostess Serving Tea Trolley Three Tier Mid Century Blue Gold" is in sale since Monday, February 4, 2019. 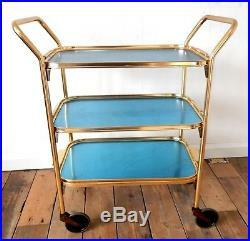 This item is in the category "Home, Furniture & DIY\Furniture\Drinks Trolleys & Tea Trolleys". 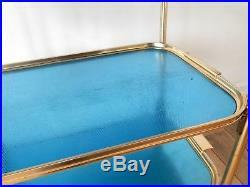 The seller is "hashtagretro" and is located in Kingston upon Thames. This item can be shipped to United Kingdom, Antigua and barbuda, Austria, Belgium, Bulgaria, Croatia, Cyprus, Czech republic, Denmark, Estonia, Finland, France, Germany, Greece, Hungary, Ireland, Italy, Latvia, Lithuania, Luxembourg, Malta, Netherlands, Poland, Portugal, Romania, Slovakia, Slovenia, Spain, Sweden, Australia, United States, Canada, Japan, New Zealand, China, Israel, Hong Kong, Norway, Indonesia, Malaysia, Singapore, South Korea, Switzerland, Taiwan, Thailand, Bangladesh, Belize, Bermuda, Bolivia, Barbados, Brunei darussalam, Cayman islands, Dominica, Egypt, Guernsey, Gibraltar, Guadeloupe, Grenada, French guiana, Iceland, Jersey, Jordan, Cambodia, Saint kitts and nevis, Saint lucia, Liechtenstein, Sri lanka, Macao, Monaco, Maldives, Montserrat, Martinique, Nicaragua, Oman, Pakistan, Paraguay, Reunion, Turks and caicos islands, Aruba, Saudi arabia, United arab emirates, Ukraine, Chile.